Robert G. Gregory challenges the apparent assumption that non-Western peoples lack a significant indigenous philanthropic culture. Focusing on the large South Asian community in East Africa, he relates how, over a century, they built a philanthropic culture of great magnitude, and how it finally collapsed under the ascendency of increasing state regulation and policies directed against non-African communities.Compelled by poverty to seek better oppurtunities overseas, most Asians arrived in East Africa as peasant farmers. Denied access to productive land and sensing economic opportunity, they turned to business. Despite severe forms of racial discrimination in the colonial society, they suffered few restrictions on their business enterprises and some became very wealthy. Gregory's historical analysis shows philanthropy as an important contribution, one that stemmed from deep roots in Hindu, Muslim, and Buddhist culture. The sense of nonracial social responsibility cultivated social, medical, and educational facilities designed for all.This age of philanthropy terminated with the Asian exodus. 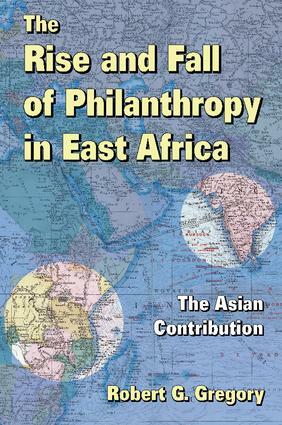 The socialist and racial policies adopted by East African governments over the past few decades have virtually destroyed the foundation necessary for philanthropy as well as the distinct Asian cultural identity. Gregory's account of the East Asian's role in philanthropy deserves great attention and sober reflection.